An affiliate network is an ecosystem designed to facilitate easy and efficient cooperation between the two players of any performance marketing context, which are the merchants/advertisers (the ones selling products or services online and are looking for partners to promote them at a cost-per-sale model) and the affiliates (the ones sending targeted traffic under this business model). 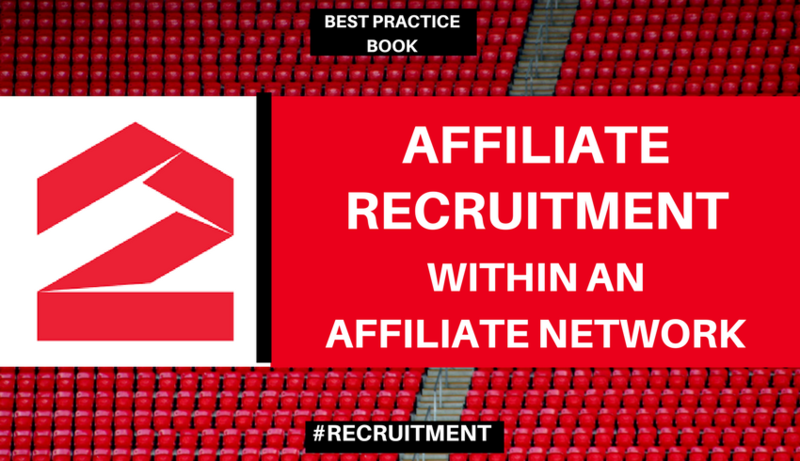 Affiliate recruitment initiatives can be categorised into two major types: recruitment inside and outside the network(s). Both components have two aspects: active recruitment (when you are contacting potential new affiliates on the basis of different criteria and propose them to work with you) and passive recruitment (when affiliates are applying to your program by themselves). In most affiliate networks, inside recruitment is almost 100% passive. However, the 2Performant platform offers several tools and opportunities to actively recruit relevant affiliates inside the network, too. Affiliate Recruitment starts from the moment you start setting up your program. The conditions of your offer, your reaction time (for processing commissions, replying to messages, or your net payment term) and your overall tone of voice when communicating with them are the factors that determine affiliates’ interest in promoting your store. Your program description is often the first point of contact between you and an affiliate. Best practice: Use relevant messages. You are looking for partners to promote your products, not potential buyers. Tell them what might really help them sell more for you. Look at what other successful advertisers do in 2Performant. You can also sign up as an affiliate and apply to other affiliate programs to understand how things are seen on the other side. If you want affiliates to write articles about you and your products, you should provide them dedicated materials (texts, images, videos). You can send them tailored information for their audience profile, especially that high-volume content affiliates (publishers, review sites, bloggers, etc.) respond very well to such actions. Make their work as easy as possible, and they will love you (and apply to your program) more. If you want to outsource a part of your pay-per-click budget and pay that traffic at cost per sale, not cost per click, you should be as clear as possible about what you allow and what you do not. You should also check your 2Performant account settings regarding these particular traffic sources. If you want to be present in price search engines or product aggregators, you should build special feeds for that. In 2Performant, there are thousands of active affiliates of all types. Knowing exactly what you are looking for, as well as your advantages compared with other advertisers in your category, and setting the conditions and the proper description from the beginning are important. Passive recruitment should generate sign-ups to your program from potential new affiliates, and you will moderate these according to your general affiliate policy. Whether they find out about your program from advertisers’ ranking or from the new advertisers’ section, affiliates can apply easily. Aside from a constantly updated description, having a good approval rate, a short payment term, AND a fast process to check and approve commissions usually attracts more affiliates. Best practice 1: Quickly process affiliate sign-ups, right on the spot if you can. You want to take advantage of the moment they apply because it represents the moment of maximum interest on their part. 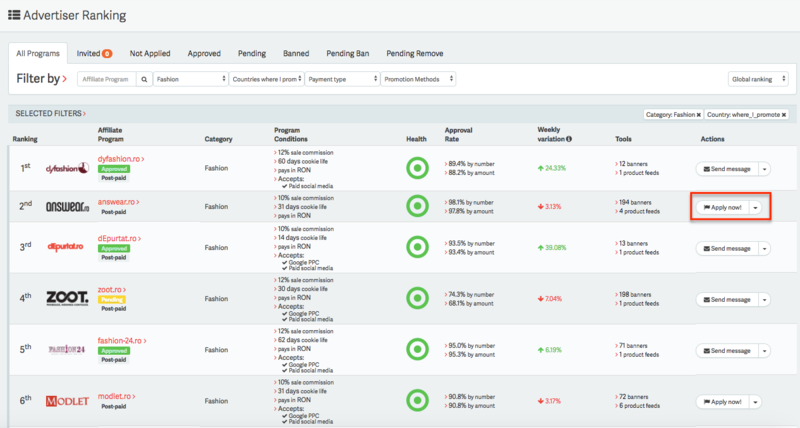 Best practice 2: Once you approve affiliates, send them a message through the platform. Thank them for their interest, and tell them a few words about your plans for the next period. Check for how long they are using the platform and their ranking in your category first. Start a dialogue with them, ask them how they want to promote you, or give them some ideas you have thought of. Best practice 3: If an affiliate who does not seem right for you applies and you decide to reject it, send him/her a message and explain the reasons for it. Even if you do not work together now, this may possibly change in the future. Once you set up your program, passive recruitment tasks should not take you more than half an hour every day. Unlike the vast majority of affiliate networks in the world, where active recruitment takes place predominantly outside the network, 2Performant offers several tools to recruit relevant affiliates for you within the network. Want to actively recruit good affiliates? How about a real-time updated affiliate ranking? It’s an industry widely accepted fact that information about top affiliates (who they are, which one is better in a certain category, and, perhaps most important, their contact information) represent a very valuable asset and is usually available only to networks teams and senior affiliate managers. 2Performant users have access to a neat real-time ranking based on the number of sales generated by affiliates in the past 90 days. A bonus is that they can see weekly variations for the top 300 affiliates, and they can invite ANY listed affiliate to work with them with just a click on a button. Best practice 1: Stay relevant and invite affiliates who are active in your category. Check their traffic sources and for how long they’ve been using the platform when you approach them. Best practice 2: Focus on newer affiliates in the platform, especially those with fast growth in your category. They are more likely to want to test a collaboration with you. Best practice 3: When you contact top affiliates, do not just send an invitation. Send them a message, too. Explain why you contacted them and, preferably, what custom conditions you can give them. Over 500 advertisers are active in 2Performant, and the competition for super affiliates’ attention is quite high. You can also condition a larger commission or a longer cookie life for a certain volume of traffic. For example, if an affiliate sends you over 1,000 clicks per month, he/she will receive a commission 20% higher than that of the other affiliates. Some of the most valuable information for your affiliates is about the promotions you organise. The better is your offer, the more chances they have to convert their traffic into sales for you. An informed affiliate is a much more valuable affiliate for you. Therefore, communicating with your affiliates quite often, just as you do with your local team or other partners (digital agency, product suppliers, courier company, etc. ), is always a good idea. To communicate with the affiliates already in your program, you can easily use the platform messaging system. In addition, in 2Performant, you have the option to communicate to all network members when you are planning a promotion, thus increasing your visibility to all active affiliates and the chances of recruiting new ones. Best practice 1: Notify your affiliates about your promotions well in advance. The longer they can prepare, the more affiliates are given the chance to generate sales for you. Best practice 2: Provide dedicated promotional tools for each promotion, such as banners, feeds, and landing pages. Best practice 3: Organise affiliate competitions on major promotions. In addition to their strict financial motivation, affiliates are extremely responsive to challenges. You can reward the best affiliates with vouchers, products, or a higher commission over a given period (e.g., the ones who generate the most sales in April will receive a 20% higher commission in May). Do not limit yourself to the affiliates you earn organically. Your affiliate program, similar to all the components of your business, is like a garden where work never ends and permanent care is needed so that it grows nicely and steadily. Just as you are looking to find new suppliers or new products for your customers, or to grow your team with valuable people, you should grow your affiliate portfolio every day. After all, affiliates are a part of your sales team and can be a very important asset that can help you win your battle against competitors. A well-done recruitment work guarantees long-term success. It is the most important pillar of your affiliate marketing program performance. The best time to recruit new affiliates is now :). 2Performant.com is a performance marketing marketplace where e-shops and digital natives can easily work together on a cost per sale (CPS) model. From 2009 to date, 2Performant has tracked more than 288,000,000 clicks and 3,190,000 transactions worth €118,000,000, for which 560 e-shops paid €7,670,000 to 59,300 affiliates. Attribution vs. Payment Models in Marketing: What can I do to pay less for a sale?